Our Customer Service team is available from Monday to Friday: 8am - 5pm GMT and can be contacted via our online contact form. Registered bookseller members can also use the call-back option in the Members Menu to ask for a telephone call during our business hours. Over the next few weeks, we will be testing the new AbeBooks Coupon system. Coupons will be issued by AbeBooks, and will be used to encourage buyers to discover and return to AbeBooks. All coupon costs will be completely covered by AbeBooks; booksellers will receive the full purchase price for all books ordered with the use of a coupon. Coupon testing will begin with our Bookseller Advisory Group and our Customer Advisory Board. If you would like to be one of the first to try out the Coupon system, we invite you to join the Bookseller Advisory Group to receive your coupon and provide your feedback on this new feature. 2007 was a very successful year for AbeBooks, and we would like to say a big thank you to all of our booksellers for supporting us throughout the year. Book Hints - Encouraging buyers to stay longer and buy more. AbeBooks Bookseller Since **** - Increasing buyer confidence. Bookseller Rating - Improving buyer satisfaction and increasing sales. Bookseller Digest Blog - For quicker, more transparent communication with booksellers. Online Help Pages - More User Friendly help for buyers and sellers. Bookstore Search facility - Allowing buyers to find sellers in their area more easily. We are pleased to introduce a new resource for the AbeBooks Community - the AbeBooks Wiki. The mission of AbeBooks is to help people find and buy any book from any bookseller anywhere. We are extending that mission to our new Wiki, where we hope you will find and share information about books – anything from appendices to collectable editions of Doctor Zhivago. Based on collaborative efforts, a Wiki is an online source of information that can be added to or edited by anyone who has access to it. The name wiki actually comes from a Hawaiian-language term meaning fast and is highly suited to such a resource because it makes information accessible very quickly. One of the best known wikis is Wikipedia. Like our Web site, the focus of the AbeBooks Wiki is books. Through contributions from both booksellers and book lovers, our goal is to make our wiki the number one source for book information on the internet! We are just getting started and have 36 articles so far, we would however, also welcome your ideas and your own articles. Things can be fixed, improved or edited later on so there is no need to worry about making mistakes! The AbeBooks Wiki is an information source, not a forum or message board - all information posted should relate to books. We encourage articles on books, book collecting, book care, authors and anything that is connected with the world of books. We are very excited to add this dynamic tool to the AbeBooks Community and look forward to seeing the Wiki grow as you share your expertise and book knowledge with others in our community. Why not go there now? With Christmas fast approaching, AbeBooks are getting a lot of coverage in many main stream newspapers in the UK with recommendations for Christmas presents. The charity signed books auction closed yesterday at noon and now that the dust has settled we are pleased to announce that we raised a total of $5267 for the United Way’s Project Literacy and PEN Canada. December 6th - December 11th Only! 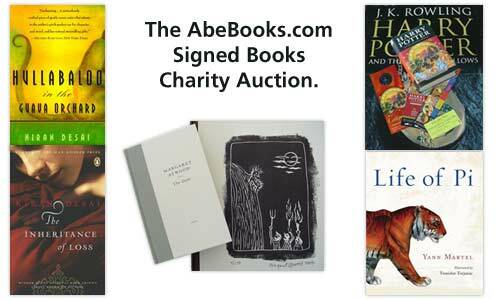 AbeBooks is hosting our third online charity auction and we have some special signed books on offer to the highest bidders. From Thursday 6th until Tuesday 11th December, we will be auctioning five books in four separate lots. The lots are an ultra-rare signed copy of Harry Potter and the Deathly Hallows, a limited edition signed copy of a Margaret Atwood poetry book, a signed copy of the just-published illustrated edition of The Life of Pi and two signed Kiran Desai books. Learn more about the books and the auction. This month we are pleased to present the third in our series highlighting AbeBooks subsidiary companies: who they are, what they do and how they can help you! This month’s featured subsidiary is LibraryThing. LibraryThing was created by Tim Spalding, a web developer and web publisher based in Portland, Maine. Tim also runs www.isidore-of-seville.com, www.ancientlibrary.com, www.bramblestory.com and mothboard.com. Since becoming a "real" business in May 2006, when AbeBooks acquired 40% of the company, LibraryThing now employs a number of talented people. What is LibraryThing? LibraryThing is an online service to help people catalogue their books easily. You can access your catalogue from anywhere—even on your mobile phone. As everyone catalogues together, LibraryThing also connects people with the same books, comes up with suggestions for what to read next and so on. Where does LibraryThing get its information? LibraryThing uses Amazon and libraries that provide open access to their collections with the Z39.50 protocol. The protocol is used by a variety of desktop programs, notably bibliographic software like EndNote. LibraryThing appears to be the first mainstream web use. How Does LibraryThing Work? LibraryThing is really two sites in one. First, it is a powerful tool to catalogue your personal library. Users add books to their catalogue by entering titles, authors, or ISBN numbers. LibraryThing then searches the Library of Congress, all five national Amazon sites, and over 78 world libraries, and returns with precise book data. Users can then edit the books in their catalogue, tag their books with their own subjects, and use the Library of Congress and Dewey Decimal systems to organise their collections. LibraryThing is also an amazing social space, connecting people with similar libraries. It also makes book recommendations based on the collective intelligence of the other libraries. AbeBooks’ BookHints are powered by LibraryThing.